This week and next, Chuck Wendig (usual disclaimer about NSFC) has set up an interesting challenge: write a thousand-words and leave us with a cliffhanger. Then we hope another writer will pick up on the challenge and write the conclusion. Not to worry: if they don't, and probably even if they do, I'll be back to finish the story myself. But next week I'll be finishing someone else's story. Update: Find Jemima Pett's continuation of Gorg's story here. I'll be back eventually to offer my own completion--though hers might find it's way into a revised version of my version. . .
Gorg the Troll stood amidst the sulfurous exhalations of the Valley of Baleful Stones and watched the balloon disappear into the distance. Aboard was the one human Gorg really wanted to kill, Duke Bale the Artichoke-Hearted. Now Gorg had no way of reaching him, no way of knowing where he would alight. Despite the slanderous stereotypes about trolls, Gorg was a peace-loving person, if a troll can be called a person. Entity. He was a peaceful entity. Only, in the last month, he’d killed two sorcerers. Both had been servants of Duke Bale. The first had turned several members of Gorg’s family back into stone, at Bale’s command. The second had been trying to prevent him from reaching Bale to exact the revenge both troll and human tradition demanded. He hoped Bale would be the third and last. To kill Bale, he would have to find him. Gorg turned in the direction of the wind and began walking. Three days later, Gorg had left all signs of sulfurous stones behind, and found the land climbing steadily. The rock here was different, lighter and more appealing, with a slightly spicy flavor and a good crunch. The air was better, too. The balloon was long gone from sight, but Gorg kept following the wind, hoping he would eventually hear word of the Duke. Unfortunately, he heard no word of anything, because the lands he traversed lacked inhabitants, at least who could speak. Gorg tried to talk to the coyotes, but they wouldn’t stop to chat, and he didn’t even know what some of the other creatures were. The land kept climbing, and he saw more small furry animals, but nothing that could talk to him. It might have made more sense to go around the mountains, return to the lands of men and wait to hear of Bale. But Gorg had a simple mind. He’d set out to follow the winds that had carried his enemy out of reach, and he continued to do so, day after day. Fortunately for Gorg, it was summer, so he didn’t freeze. Gorg was a Drylands Troll, adapted to deserts. Heat didn’t bother him, and trolls didn’t drink except for pleasure, but he had no experience of cold. Even in midsummer, as he climbed higher he began to find nights a bit uncomfortable. If Gorg had been more of a thinker, he might have gone to seek out a representative of the king. It was the king who had banished Bale to the Valley of Baleful Stones, and it was the king, ultimately, that Bale was after. King Celery the Half-Wit wasn’t much good, but his ministers did make a point of keeping track of would-be regicides, if only in case they wanted to make use of them. For the most part, though, the ministers, like most of the denizens of the kingdom, preferred a king who did very little. They had no wish to allow Bale to succeed. They would have been happy to help Gorg achieve his goal, had they but known of his single-minded pursuit of the killer. Gorg paused in his pursuit of the long-vanished balloon. The wind had changed direction. It no longer led him up the mountains, but now blew along the face. Even Gorg knew that the balloon was far ahead and probably not following the same winds, even if it were still aloft. But he had no other guide. When he pursued the sorcerer Mergle, he’d been guided by a magical trail left for another. When he crossed the Iron Desert to find the Valley of Baleful Stones, he’d followed a tip from a gnome met in a tavern. Now he followed the wind. What he was rapidly learning didn’t make sense was to attempt to traverse the faces of the mountains. Now, instead of climbing steadily, his route took him constantly up and down, clawing his way up steep slopes and crumbling glacial moraines—though those provided a variety of interesting rocks on which to snack—only to drop again into deep valleys and fathomless gorges. 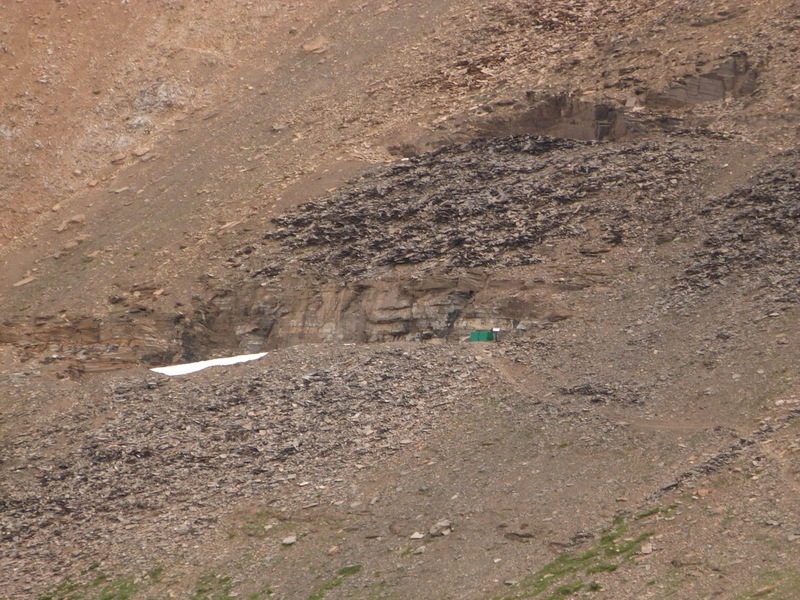 What’s more, as he went north along the range, the slopes grew steeper and more challenging. Trolls are made of stone, and climb well because they can cling to that from which they were born. But even Gorg was beginning to find some of the canyons a bit precarious. And nearly every one was filled with a roaring stream of milky water, laden with grit and rolling stones. Gorg was less comfortable with water than stone, though his immense stony weight allowed him to ford streams that would have washed even the boldest human away in seconds. And still he would not digress from following the wind. Inevitably, the worst happened. Gorg was partway down yet another cliff when he looked below for the first time. In the dark, shaded depths of the canyon, he caught the gleam of water. He descended a bit further, fingers and toes growing into the tiny cracks in the wall that allowed him to scale cliffs no human could. Now he could see that the water filled the gorge. Completely. Worse, it was not rushing past as the other streams had done. This water lay still, its dark surface suggesting unknown depths. Gorg froze. Only one thing could stop his pursuit of Bale, and now it seemed he had found it: deep water. No troll could swim. That would be expecting too much of a being made from stone. 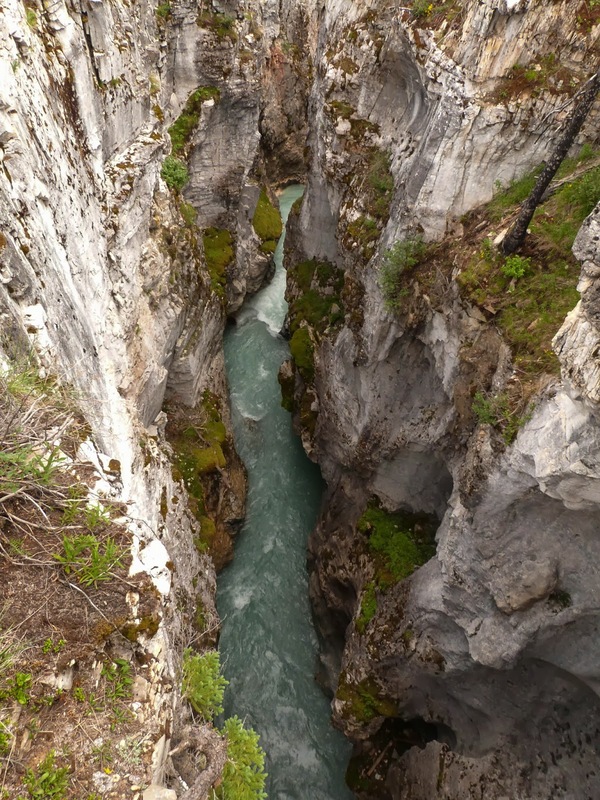 Unable to more forward, equally unable to grasp the need to go back or around, Gorg froze in place, sending deeper and deeper roots into the stone of the canyon while his mind sought desperately for answers. In minutes, he would be too deeply attached to the stone to move again. Yeah, I know. The whole cliff thing was supposed to be metaphorical. But hey, sometimes I'm just feeling literal. . . So sue me. Published by Little, Brown and Co, 2013 358 pages. Source: Library. Pulled off the New Book shelf because it looked interesting. Matt Thorsen knows he is a direct descendant of the Norse god Thor. He just doesn't know that he's going to be the one who has to save the world. He's only 13, even if he is big for his age, and now he's supposed to create a team of other descendants of the gods and go out and keep the world from ending. It doesn't help that the children of Loki, the Trickster God, aren't very fond of him, but he persuades Fen and Laurie to join his quest, and they have the start of a team. Right up front I need to say that this book does two things I'm not wild about. The first is minor, and is overcome by a gripping story. I'm not really that crazy about the supernatural kids in a normal modern world, but that's a matter of taste and it's well done. I am even less crazy about cliffhanger novel endings, so consider this a warning: this book stops in the middle. There is a modest sense of resolution--a few things are figured out--but the story is too incomplete for my taste. Again, this is not something that necessarily means you won't like it. You just need to know that. I was fairly quickly drawn into the story, once I got past a little reluctance about the setting issues (see above and my personal tastes). The book is liberally illustrated with full-page black and white pictures which look a bit like Manga, stylistically. They don't do a lot for me, but again, that's taste. By the time I was 50 or 60 pages in (not that far, really, with so many pictures and lovely large clear type) I was pretty hooked. By the mid-point, the action heats up and really doesn't stop, so it's a gripper. Relationships are a bit simplistic, but these are Junior High kids--they are big on drama, but not very good at self-knowledge. The story is told by an omniscient narrator, and the authors have done a good job with that, so that there's always clarity about who's perspective we are seeing from, and no feeling of head-hopping. The writing is generally tight and smooth, and there were no editing or proofing issues that leapt out at me (except maybe a bit of geography, but that's not a huge issue and I only know because I checked on the map). Finally, to think about this in terms of the on-going discussion here and on Goodreads about kids without parents, most of these kids have parents--good and bad. But the parents are pretty undeveloped, and are very quickly left behind. The authors have for the most part chosen to removed the kids from the help and guidance of adults, who on the whole become, not exactly the enemy, but impediments to the much more important task the kids face. I think that any kid who likes Rick Riordan or Harry Potter will like this, and the saga promises well. I just would prefer not to have to wait however long it takes to bring out Book Two! One final note: it's a bit of a shame to vilify wolves as this book does--they are for the most part the fighting arm of the badguy side. In the real world wolves have enough of a bad rap without this. But, then, these are werewolves, not the real kind! Full Disclosure: I borrowed Loki's Wolves from my library, and received nothing whatsoever from the author or publisher in exchange for my honest review. The opinions expressed in this review are my own and no one else's. 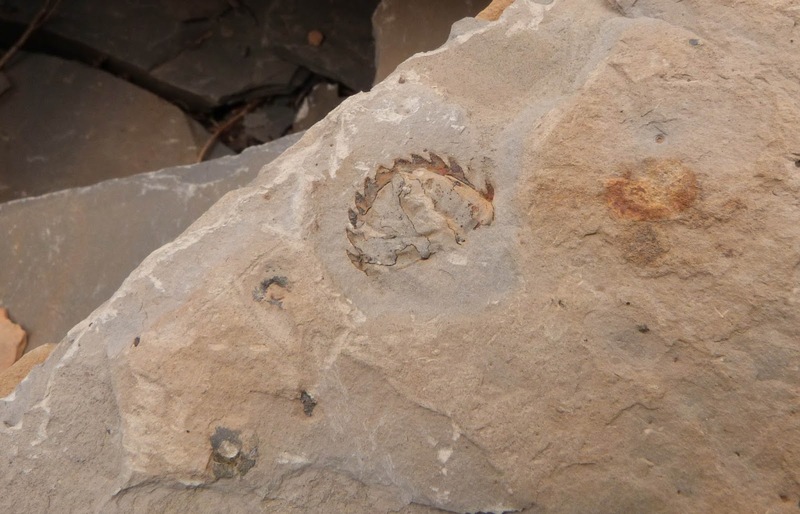 Wonderful Life: The Burgess Shale and the Nature of History, by Stephen Jay Gould. 347 pages, including notes and index. This non-fiction work is a combination of history and science, recounting both the discovery and interpretation of the 530-million-year-old creatures in the shale, as well as the significance of these followers of the "Cambrian Explosion" when the variety of life took off. He covers both the personalities and discoveries of the major players in unraveling the mysteries of the Burgess Shale creatures, and also the ways in which their discoveries changed our understanding of evolution. Gould's subtitle might make one wonder about the connection between such early creatures and, say, Washington crossing the Delaware, but that's because we tend to think of history as human history. The history Gould is considering is the history of all life, and really it's about the nature of evolution. The book tells two stories, then: the human history of discovering, misinterpreting, and re-interpreting the fossils from high on the side of a mountain in the Canadian Rockies--and the scientific history of how life on earth got from the weird creatures depicted on the cover to, well, us. The two threads are seamlessly intertwined, and the one helps illuminate the other, so that my improved understanding of paleontology helped me to understand the interpretations made by scientists along the way, and their journey to understand helps me grok the process of evolution. The book is intended for a lay audience, but Gould does assume a certain familiarity with the basic concepts, though he does a good refresher on the key points. I found the paleontology about as complex and in-depth as I'd want to go, and did find my eyes glazing from time to time. Not surprisingly (I am an English Lit-and-history type, after all!) I found the human stories more accessible and engaging. His analysis of why Charles Wolcott, the original (1909) excavator of the fossils, went so far wrong is a fascinating study of our human ability to see what we are looking for. Gould is an excellent writer of science for the normal person, and I can recommend the book to anyone wanting a better understanding of the origins of life and evolution. Four stars (I'm dinging him a bit for losing me in some of the technical stuff. which might not be fair, but there it is). For fun: the reason I read this book is that this summer, on our vacation trip to the Canadian Rockies, we hiked up past the Wolcott quarry and did a little searching on our own hook for the fossils. You can't enter the quarry, but there are lots of lower-quality fossils in the shale either side of the trail below it. The visit required a 12-mile hike with 3000' of elevation gain (and loss again, which is what hurt most), but added great views to scientific interest. My best fossil. I have no idea what it was. 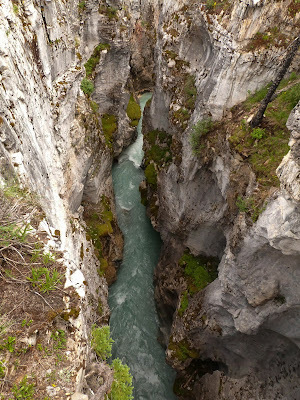 The view from the Wapta Highline Trail just below the quarry. Full Disclosure: I bought Wonderful Life at the Visitor's Center in Banff National Park, and received nothing whatsoever from the author or publisher in exchange for my honest review. The opinions expressed in this review are my own and no one else's. They also reflect my understanding of the subject matter and any errors therein are mine and not Mr. Gould's. Time for another Flash Fiction challenge from Chuck Wendig, king of brilliant and profane writing advice, and home of the best weekly writing challenges. This week, he gave us a list of 20 potential sources of conflict for a story, and I spun the virtual wheel of fortune. Change gave me "machines are taking over." So I give you. . . I may be the only living person who really knows what happened on Surely You Jest. The planet, originally 165432Bb, was named by the first settlers for their reaction to its rocky surface. It had been classed as suitable for human habitation, but it clearly wasn’t going to be anyone’s vacation paradise. Later, when 165432Bc was settled and found to be marginally more pleasant, the settlers named it Don’t Call Me Shirley. Naturally, the two became known as Jest and Shirley. The effort required to make Jest genuinely habitable was immense. To meet it, the settlers developed and deployed machines on a scale that at that time had been tried nowhere in the galaxy, and they were sophisticated machines. An ordinary tractor-bot couldn’t handle the rocks or the slopes. Jest tractors had what amounted to human reflexes to stabilize them. And so on. Since the incident on Jest, I think they make settlement machines a little differently, and usually send them in alone. But back then, they dumped off settlers on any habitable world with a selection of resources, and left them to figure out how to make a go of it. By the time the region around the original settlement, Jester, was rendered both habitable and arable, the residents had figured out how they could inside and do the work remotely. Right from the start, in the manner of humans everywhere, the Jesterites had worked to make the machines more independent, to free the operators to do other things. Early models required a driver on board, directly controlling operations. Then they started to drive them remotely, but still in real time. Gradually, they learned to program the machines for a full day’s work and just let them run. At some point, several generations from Landing, someone realized that no one was programming the machines at all anymore. They didn’t make a big deal about it. Some worried a bit, but most agreed that it was a good thing, freeing the citizens to create a rich culture. And it was proof of their own skills, to be the first in the galaxy to make truly independent machines. I learned all this from the Galactic Records library while I was on my way to Jest with a load of—well, never mind what. I always read up about my destinations, and I the idea of independent machines made me a little uncomfortable. But, I’m from Last Stop, where we always keep our fingers on the buttons and figure work is a good thing. At least, the Elders think that about work. I figured adventure was a better thing, so I took to space freighting. I’m Indie, so I get around, wherever the cargos want hauling and the price is right. But I’ve only gone to Jest once. A thousand square miles of terra-formed farmland surrounded the city of Jester, providing everything they needed. And not one single human moved in all that land. Just the machines, going about their business. It bugged me. I felt a bit squirmy even before I landed. Last Stop, which was actually a rather early stop in terms of galactic settlements, had been inhabited for about 100 generations. Jest has only been human space for five. Five generations maybe wasn’t enough to forget that the first generation had short, nasty lives, cut off by lung disease from the dust and cancers from the radiation of 165432B, which was stronger than that of Sol on Earth. People who stayed inside lived longer. It’s not so surprising that staying inside became a goal for most inhabitants. It only took me a couple of days in Jester to see it, though. The machines were up to something. There was less work being done, and a surprising stream of machines coming in with repair requests. Sometimes the Techs couldn’t even recall what the machines had needed. I watched a machine go back out after “repairs.” It headed straight for the horizon and disappeared. Maybe it worked out there. An hour later, another did the same. After the third machine in as many hours had followed the same path, I got out my ground scooter, the one-man air bike with double hover, and followed. Two hours of fast travel bought me an answer I wasn’t sure I wanted. Forty-six large machines congregated in a valley far from Jester. While I watched from what I hoped was a hidden point, a forty-seventh joined them. They all looked like they were designed to destroy things. I figured they were supposed to be the ones pushing the frontiers, turning Jest’s rock into soil. I moved a little closer. One of the machines rotated its scanning cameras to view me, and rotated slightly to improve the view. Immediately dozens of scanners locked on me, and I began to sweat. When the first one moved, I hit the rocket-boost on my bike and got out of there. I stayed as high as the bike would fly all the way back to the city. I couldn’t convince anyone in Jester that there was a problem. None of the techs could recall exactly what they’d done to the machines, besides “routine maintenance,” but that didn’t seem to bother them. In the end, I did the only thing I could do. I got out of there and left Jest to its fate. Oh, I notified the Galactic Central Settlement Commission, but I doubted they would do much. Bureaucracies move slowly, and I had a feeling the situation on Jest was going to change fast. Maybe they’d be in time to evacuate some of the people to Shirley, if they could convince any they needed to go. As for me, I’m not taking any more commissions to that system. The machines are taking over, and I don’t want to think what might happen if the contagion spreads. This work and all contents of the Ninja Librarian blog is the sole property of Rebecca Douglass and in protected by copyright. Please feel free to link to any page, but please ask permission to copy blog contents or fiction. Thank you. The Princelings and the Lost City, by Jemima Pett. 169 pages. Fred and George are back, and with them Fred's love, Princess Kira. Having taken a wrong turn on the way to March Castle, the three--along with Munch, their coachman--stumble into the lost Arbor Castle. Despite it's deserted appearance, it's not as empty, nor as legendary, as they think. It takes the combined brains of all three to get them out of this one! A sinister city, a secret society run only by females, capture by bandits and sneaky impersonations! What more does a story need? Well, besides Fred and George, the incomparable Princelings from Marsh Castle, and an airplane that runs on strawberry juice. The third book in the Princelings of the East series has a tight plot, just enough suspense, and a happy ending. Editing and language are as always top-notch, and the plot is fun and generally believable (once you engage in the willing suspension of disbelief necessary to buy into a world of guinea pigs that runs on strawberry juice, of course). This book may verge a little onto YA territory rather than MG, though it is completely clean and there is little violence. The less-savory aspects of the culture of Castle Arbor are never directly stated, so it is likely that younger children will miss the implications, but they are there. I would not have hesitated to give it to my boys when they were the right age (being teens, they no doubt can now find or invent eyebrow-raising implications anywhere they want). More to the point, the book grabbed me within a few pages, and I soon reached the point where I didn't want to stop until everyone was safe! I lost a little sleep with this one because I just had to finish. Yet another great addition to the world of the Princelings, and I heartily recommend it! 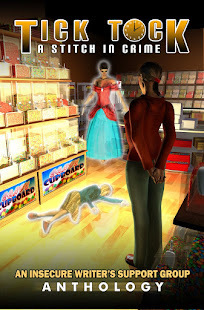 Full Disclosure: I bought The Princelings and the Lost City and received nothing whatsoever from the author, publisher, or narrator in exchange for my honest review. The opinions expressed in this review are my own and no one else's. I've been in book editing mode for several months, which has made me do a lot of thinking not only about editing but about outlines, planning, and making the first draft closer to where I want it to be. 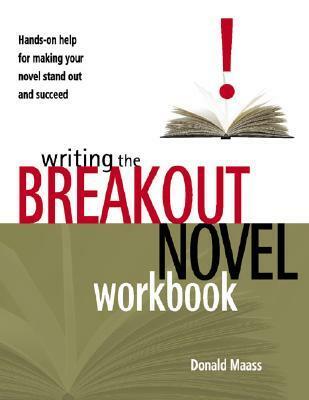 I also just picked off my shelf and started reading a book that's been mouldering there for several years, Donald Maass's Writing the Breakout Novel Workbook. (I picked it up at the library booksale for cheap, and then never read it). It's giving me a lot of food for thought about character development and more. But even before I picked it up, I'd been doing some things I've never done before: plotting the story, and writing back-story on leading characters. I've also gone back for another look at How to Write Good by John Vorhaus to refresh my mind about pivots and turning points. Partly, I'm doing this because I want to make my next book easier to write and--especially--easier to edit. And I want to do that partly because I want to shoot for a NaNoWriMo (that's National Novel Writing Month, which is November) head start (the target for NaNo is 50,000 words, which is not a full draft of a genre paperback). My Ninja Librarian novels were really collections of short stories that offered a modest story arc overall. But this one is a murder mystery (a sequel to one I'm currently editing, which is partly how I know the first version needs to be better!). And a mystery requires a tight plot, and that seems to be requiring a lot of thinking about a lot of things. My efforts to draw maps for this book, as well as for the current WIP, a middle grade fantasy I'm currently calling Halitor the Hero, are laughable, or enough to make you cry. I need to find a better way to get my mental geography onto paper (it may involve bribing Eldest Son, who creates gorgeous maps of real and fictional places). I'm hoping that by November, I'll not only know what the story will look like, but more about the town and the people than I will need for this book--I want the world firmly in place in my mind so that I can keep expanding and developing with future books. Wish me luck! And leave your tips and tricks and ideas in the comments. I can use all the help I can get. I didn't get anywhere with the Chuck Wendig prompt this week, so I decided to go back and do another from last week's settings. I really liked the idea of "a Starbucks at the end of the world" so I took that and ran with it. A note on the science of this one: it's bogus. Climate change is real enough, but the rest I totally made up. To the best of my knowledge, caffeine is not holding the physical world together, only the social one. I have no idea if coffee bushes could grow at high latitudes. And I'm almost 100% sure that sacrificing caffeine-hyped 20-somethings to volcanoes will not prevent them erupting. Here you go. The end of the world in 996 words. No one ever said the world would end like this. In all the movies and novels, the apocalypse was always about zombies and explosions and asteroids, or the sun going nova. Nuclear war. That sort of thing. No one, ever, thought it would come this way. Oh, everyone knew that climate change meant big trouble. Rising sea levels, bigger storms, more fires out West. It got to be routine, cleaning up after disasters. And farmers—they adjusted their methods, moved into new areas as some grew too hot or too wet for farming. It’s hard to farm beneath the ocean, but it seemed like there was always somewhere to go. And we never noticed the bigger threat, never saw it coming. Coffee is grown in parts of the world most First World people just don’t think about much. Somewhere way off in equatorial lands, coffee plantations were moving gradually up the mountains, and sometimes farther north. But coffee doesn’t adapt well to some things, and even warming northlands aren’t the same as old-style equatorial highlands. When people talked about adapting to climate change and shifting toward the poles and all that, they forgot one thing: climate change doesn’t change the length of the days. Some plants love the long summer days. Cabbages and squash are happy to grow 24/7 for a few short weeks. Tomatoes, not so much. And coffee, not at all. Efforts to introduce coffee bushes in Canada simply failed. Every one died, after a year or two of refusing to produce a single coffee bean. So the growers stuck with moving higher up the equatorial mountains—and then they ran out. Nowhere any higher to go. Fine, everyone said. Coffee’s a luxury. People don’t need it, except maybe a few crazy writers. Somehow, while no one was paying much attention, coffee had become the glue holding the world together. And I don’t just mean us humans, though civil society was the first to go. 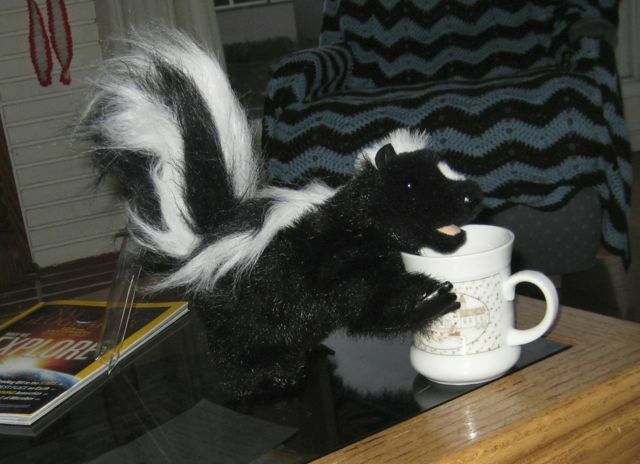 People in caffeine withdrawal get testy, and civilization began to collapse pretty fast. They tried to switch to tea, but most tea cultivation had already been lost, to rising seas and rising temperatures and everyone drinking coffee instead. And it just didn’t do the same thing. That’s how I ended up here, at Starbucks. The coffee source. One on every street corner from Boston to Bombay. Before the collapse, they had spread literally everywhere. Tiny villages in Africa and the Andes. Now those remote Starbucks were the last places with any beans, mostly because they never did much business. Most have been raided or run out by now. Maybe this Starbucks is the only one left, in a deserted mountain village so remote no one ever knew we were here. The coffee is stale now. It’s been three years since there was a coffee crop, and the strange fellow who runs this place saw it coming. He bought up every bean he could find—the stuff the big buyers wouldn’t touch, the sweepings from the floor of the dryer buildings, anything the local farmers would sell him. He even tried to keep a few bushes going in his own yard, but in the second year they died along with the last of the commercial plants. The wild ones were long since gone. I had already moved here, hoping to solve the problem at the source before it was too late. All I’ve managed is to be one of the last survivors. When the crop failed most people left this place. Only the owner and I are here now, with our dwindling supply of coffee beans. While the Coffee Riots destroyed Seattle first, San Francisco, New York, Paris and London weren’t far behind. Then the smaller cities in every country around the world. Smart people migrated outward, buying whole beans and Folger’s ground with equal abandon, and hoarding it all. Perhaps a few of them are left, but I fear most were killed in the panics. Civilization is gone, but it’s worse than just that. I’ll die before the end, because our beans are nearly gone too. But I’ve seen the beginning of the end. With the caffeine removed from the water cycle, entire ecosystems are collapsing. In the hundred years since the first Starbucks opened in Seattle’s Pike Place Market we have grown, ground, brewed, drunk, and excreted so much coffee that no water supply on earth is untainted. Because it happened slowly enough, the ecosystems adapted. But the change back has been too sudden. I wasn’t surprised when the marine animals began dying off. But it shocked me when it hit the trees. First to go were the great forests of red cedar and fir up along the coasts near Seattle. That made sense. But it spread, and with the loss of the forests came a huge influx of carbon into the atmosphere, which spelled the end. It no longer matters that even the tectonic plates seem to have been made restless by the loss of coffee from the hydrologic cycle, because it’s already too late for earth. Oh, the planet will be here. I suppose it’s not really the end of the world, just of all living things as we know them. Including us, of course. But I won’t be here to see the super-heated ball this globe is bound to become, because the volcano is restless and uneasy. They used to keep it happy with sacrifices of young daredevils. All fully hyped on coffee, of course, and under the impression they were climbers. Now the supply of both coffee and daredevils has run out, and the eruption will come any day, and take us with it. We’re ready. Without coffee, the two of us here in this dingy, dusty Starbucks on the slopes of a volcano are more than ready to be done. I can feel the earth shake. It won’t be long now. Pictures of Hollis Woods, by Patricia Reilly Giff. Read by Hope Davis. Hollis Woods has spent her 12 years in a long string of foster homes, and can't every seem to get it right. She runs away from all of them after a while, even from the one home where she really wants to stay. Now she's been put with Josie, a retired art teacher who's beginning to forget things. For the first time, Hollis starts to think about what someone else needs, and tries to figure out how to make it happen. I really enjoyed this quick read (even on audio books, it took only 3 1/4 hours, and I listened to the whole thing in one day, while doing my Saturday chores). Hollis narrates her own story, and her voice is a mixture of defiant, self-absorbed, disheartened, and loving which I found authentic. Her one carefully guarded wish is for a family, but her own sense of undeserving keeps her from grasping it when it's in reach. It takes the time with Josie and her cousin Beatrice to teach Hollis a few important things: that she is talented (Hollis is an artist; thus the "pictures" of the title), that she is worth loving, and that she can love others. To me the book had a feel of historical fiction, as though set perhaps 20 or 30 years back, but I'm not sure that's the case. Maybe that just springs from a wish that the foster system might be less broken now than it was for Hollis. To an adult, the ending feels a little too tidy and happy to be realistic, but I think it's perfect for middle grade (and, frankly, I am a sucker for a happy ending, so I'm not really complaining). The writing is polished and language well-chosen. There was one glitch in the recording, which seems to be actually in the Overdrive file, as I downloaded it from two different library sites (which I realize come from the same central Overdrive source) and had the same problem at the same spot. So I did miss a bit from the start of Chapter 17, but was largely able to fill it in, and in any case that is no fault of the book or the author. One other note, in light of my recent discussions of middle grade books about kids without adults: this book is an "orphan book," of the variety where the orphan finds a family. But the book is about the journey to that family, and during that time Hollis is more often in contention with the adults around her than relying on them. Her distrust is completely natural and realistically developed and portrayed, including the ways in which her efforts to figure it all out for herself lead her astray. I think that Giff has managed both to use the orphan motif to give her lead child character autonomy and to show her and the reader why it might have been better to talk to the adults, though clearly not to all the adults. Wholly suitable for kids from about 3rd grade up. There is no violence to speak of, and no sexual situations. The language seems accessible to younger readers. The message of the book seems positive. Full Disclosure: I checked Pictures of Hollis Woods out of the digital library and received nothing whatsoever from the author, publisher, or narrator in exchange for my honest review. The opinions expressed in this review are my own and no one else's. Crocodile on the Sandbank, by Elizabeth Peters. Book 1 of the Amelia Peabody mysteries. Victorian spinster Amelia Peabody is en route to explore Egypt when she picks up a new companion, a young Englishwoman starving on the streets of Rome. The two proceed to Egypt, where they stop at an archeological dig and stay first to help an ailing member of the team--and then to solve a mystery. 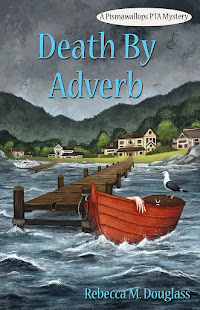 This is the first of the Amelia Peabody mysteries and serves as an excellent introduction to an enjoyable (though very outspoken and at times a bit cranky) amateur sleuth. Told in the first person, the story moves pretty quickly, and there is plenty of humor and virtually no gore. The mystery is not particularly mysterious--I had a pretty good idea from very early on who was behind the troubles at the dig--but it's really all about the characters, and they are worth getting to know. The 19th-century setting and narrator has forced the author to deal with Colonial British racism, which I felt she handled pretty well. Amelia isn't a 21st-Century woman with politically correct ideas, but she is a rather advanced Victorian, whose rebellion against the traditional roles (and dress) inflicted on women has perhaps given her a little more open mind to the possible qualities of those who are not British. The history and archeology are handled well, by which I mean that they are both accurate and well-blended into the story. I listened to the Blackstone Audio version, and felt that the performance was top notch. Susan O'Malley gave Amelia Peabody a voice in my head which will almost certainly remain as I read other books in the series. I recommend this book to anyone who likes cozy mysteries (i.e. largely non-violent mysteries with more focus on character than mystery), as well as those who enjoy historical fiction, always with a twist of humor. If forced to give a star rating, I'd probably do about 3.5, as the mystery is a little too easy. The book is no work of great literature, but it's a fun read, and some days that's all I need. Full Disclosure: I checked Crocodile on the Sandbank out of the digital library and received nothing whatsoever from the author, publisher, or narrator in exchange for my honest review. The opinions expressed in this review are my own and no one else's. Last night, we got to be a little part of history. In 1989, during the Loma Prieta earthquake, a section of the San Francisco Bay Bridge (from Oakland aka "The East Bay" to SF) collapsed. People immediately leapt to an understanding that the bridge was seismically unsound, and needed to be replaced. Fast forward (?!) 24 years to 2013, and last night saw the opening of the new bridge--and we were there. 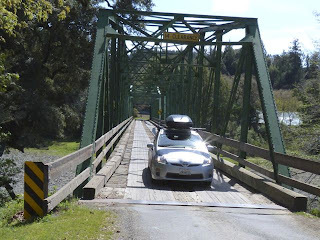 No, silly, not THAT bridge! We were enroute home after spending the holiday weekend at the in-laws', and heard on the radio that the bridge, which had been closed since last Wednesday night to make the switch from the old to the new, was going to reopen between 9 and 10 p.m. (rather than at 5 a.m. as advertised). Since we were on schedule to arrive about 9:30, we decided to head on in and hope it would be open when we got there. It wasn't, but we figured it made more sense to wait than to try to drive around to any of the other bridges (a long way out of our way). Plus: getting to cross the bridge within minutes of it's opening. They were late--more like 10:15, but we got to cross, and I hope the kids remember being there. The bridge is a work of art (which is a source of controversy in itself, but I'm kind of glad it's not bland--the Bay deserves art, not bland). Took a while for traffic to get rolling, and there was a pretty good jam at the toll plaza, but then we were on the bridge, with the lights illuminating the single tower and angled cables, and everything shining and new--except the old span, alongside, looking sad and weary (built in 1936, I think). I don't have my own picture, and to avoid accidentally stealing something not in the public domain, I'll send you to take a look at the photos in the SF Chronicle. I just hope the boys don't fall asleep in class today, since the delay meant getting home well after 11! Back in my younger years, I harbored moderately serious fantasies about hiking the Pacific Crest Trail (now that I'm 50, that's been reduced to a tentative plan to hike the John Muir Trail, or a version of it that suits us, in a couple of years). (Note: the PCT is 2,660 miles and runs from Mexico to Canada along the Sierra Nevada and Cascade mountains. The JMT is 210 miles and runs from Yosemite Valley to the summit of Mt. Whitney, the highest point in the contiguous US). Even though I do not now expect to ever through-hike the PCT (and don't actually want to--too many parts of the trail just aren't that fun), I still love reading books about it. This month, a friend sent me two books about couples hiking the trail. Both were winners of the Barbara Savage Miles From Nowhere Memorial Award, given to compelling narratives of personal journeys in the form of muscle-powered adventure. First, a note about the Pacific Crest Trail, because this is important to understanding both books: The problem with walking 2660 miles in a single season is that you have to start very early. This is fine for the desert portion of the trail--in fact, even March is getting almost too hot there. But the Trail in the first 300 miles, alternates between desert crossings and climbing up over 10,000-foot peaks in the San Bernardino Mountains. Weather seems to be wrong more often than not, and you're never quite in the right place at the right season. If you are too early, the Sierra is impassable (and you have to hike it when it's only sort of passable). If you are too late, either you die in the desert or you freeze in the North Cascades in October (and probably get snowed out and have to quit). And even by time you reach northern California, you are hiking through some very hot and dry areas in the middle of summer. There are places where you just have to hike 25-30 miles in a day, because there is no water. 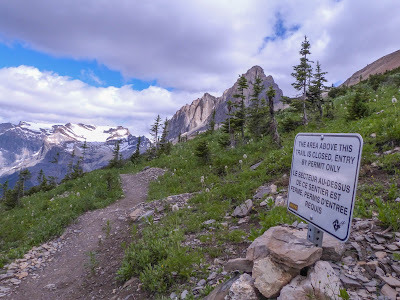 The highest point on the trail is over 13,000' (a pass in the Sierra); the lowest is about 180 feet, where the trail crosses the Columbia River. That's a lot to ask of any body. If books like these talk a lot about food, there's a good reason for it. I Promise Not to Suffer: A Fool For Love Hike the Pacific Crest Trail, by Gail D. Storey. 211 pages, including appendix on gear and food. Source: a friend sent me her copy to read, along with A Blistered Kind of Love (see below). Summary: Gail Storey and her husband of 19 years deal with his midlife crisis by getting outside. He is fairly experienced (he hiked the Appalachian Trail a few years earlier); she is not. Gail is going along, originally, primarily because she doesn't want to be left behind (as she was when he did the AT; she started that with him and quit after 40 miles). The story is as much about their relationship and her growth as a human as it is about the trail. Review: First off, I want to say that I found it immensely encouraging to read this book, because Gail and her husband, Porter, are in their 50s. Not 20-somethings who have bodies willing to take a beating, but people like my husband and me--fit, but having to be a bit cautious about the level of abuse we dish out. And the trail does dish out hard stuff for them. Weather, distance, elevation changes, altitude. And Gail's body does not take kindly to this. Instead of hardening to the trail, she loses her appetite and loses way too much weight. But here's the thing: instead of wanting to quit, she falls in love with this painful way of living. She is finding out that there is something she's out there to do besides be with her husband, and she's sort of sitting back and letting it happen. The Trail chews Gail up and spits her out. But her account of it, and of the spiritual change that takes place in her through it, is worth the reading. "Like me, everyone in the meditation hall seemed hell-bent on finding peace." A Blistered Kind of Love: One Couple's Trial by Trail, by Angela & Duffy Ballard, 264 pages. Source: given to me by a friend (see above). Summary: Angela and Duffy Ballard hiked the Pacific Crest Trail in 2000, as a pair of not-yet-engaged 20-somethings. He was in medical school, she working, so they operated under strict time constraints (he had to be back in Philadelphia on Sept,. 20 to start school--a pretty early end date for the trail). Neither of the pair was particularly experienced, though he at least had done some camping as a kid. This book is about both the relationship and the trail, but perhaps more about the trail than I Promise Not to Suffer. While the Storeys practiced a fairly extreme ultra-light approach, the Ballards opted for heavier packs and more comfort. It's interesting to see how the two options pan out, as each has obvious drawbacks (a scant tarp is dubious shelter when the weather truly goes wild, but a tent is a lot of weight when you have to carry a gallon or more of water and 10 days worth of food). 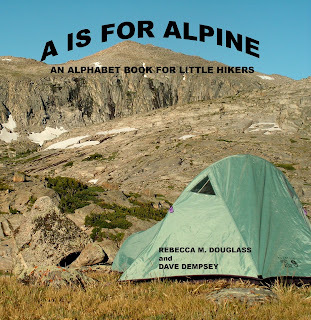 Review: It was fun to compare the two books, though I don't really recommend reading two such books back-to-back, especially if you have responsibilities that you might prefer to leave behind (no, I won't be running away to hike the PCT. For one thing: winter. But it's tempting). 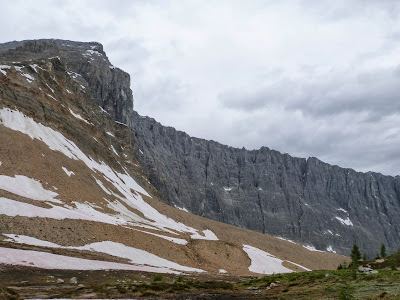 I found this to be a more compelling narrative of the trail, leaving me with both a more complete sense of what it's like to hike it and a more even narrative. This is probably because the book is written by both Angela and Duffy, in a back-and-forth style that could use some visual cues to tip the reader off, but otherwise works well. I like that incidents--especially fights--were dissected from both sides. Fights, you say? Well, naturally. Neither couple gets away without conflict; it would be unbelievable if they did. But this pair had only been together for a year or so, and had a lot to learn about relationships and each other, at the same time as they were learning about hiking. An impressive survival feat! 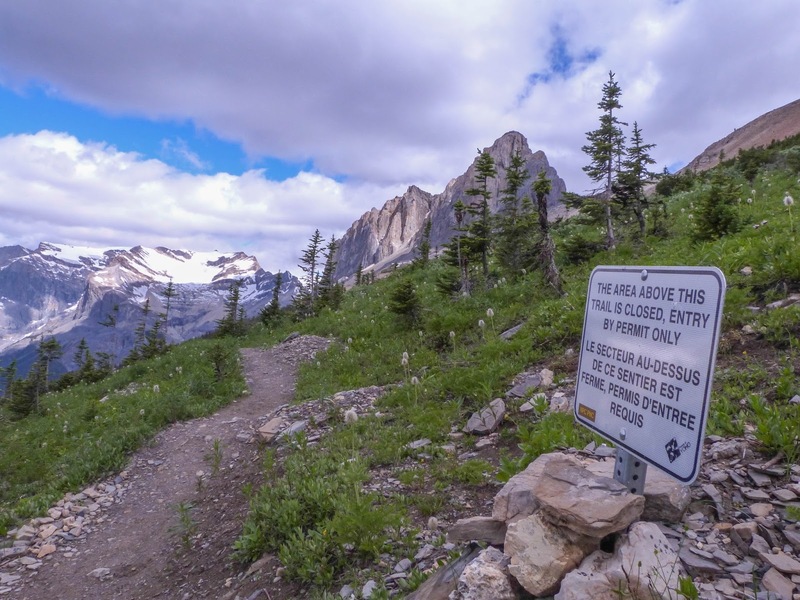 It's not surprising that they express fears and worries about things that a more experienced hiker (I've never done a long trail, but I've spent a lot of nights in the wilderness) might dismiss. I found myself at times feeling superior ("well, gee, didn't you guys even know. . . "), but it's part of what impressed me: that two such neophytes actually made it to Canada (even if they didn't hike absolutely every section; time constraints forced a couple of skips). Favorite bit: the first acknowledgement in the front of the book is. . . the peanut, without which their hike (and many others) wouldn't have been possible. Full Disclosure: I was given copies of I Promise Not to Suffer and A Blistered Kind of Love by a fellow hiker, and received nothing whatsoever from the author or publisher in exchange for my honest review. The opinions expressed in this review are my own and no one else's.